This illustrated small book presents colorful examples from an amazing find of 19th-century bottles in a shipwreck in the deep Atlantic, 100 miles off the coast of Georgia. The bottles were en route to New Orleans in October 1865, just months after the end of the Civil War. They present a fascinating time capsule of popular goods of the times - from popular herbal "bitters" (with their astoundingly high alcoholic content) to quack medicines (Mrs. Winslow's Soothing Syrup for Children) to condiments, hair tonics, writing inks, perfumes, beer and wine, and more. The SS Republic was a side-wheel paddle-steamer that departed New York harbor in October 1865, bound for New Orleans. Along with some 80 passengers and crew, its shipment included a remarkable cargo: a reported $400,000 in gold and silver coins. The ship also carried other goods sorely needed in New Orleans, once the cosmopolitan jewel of the South, but by then depleted by years of war and Union occupation. But the steamship ran into a fierce hurricane and sank after two days battling the violent winds and high waves. Most of the passengers and crew were rescued from lifeboats in the days following the sinking, but the cargo was believed lost forever. The remarkable discovery in 2003 and archaeological excavation into 2004 of the wreck on the Atlantic floor (as told in the recent book Lost Gold of the Republic, by Priit J. Vesilind, Shipwreck Heritage Press) by Odyssey Marine Exploration of Tampa, Florida, would eventually yield more than 51,000 coins. Today, those Civil War-era coins are worth many millions of dollars to collectors (perhaps as much as $75 million per appraisals). 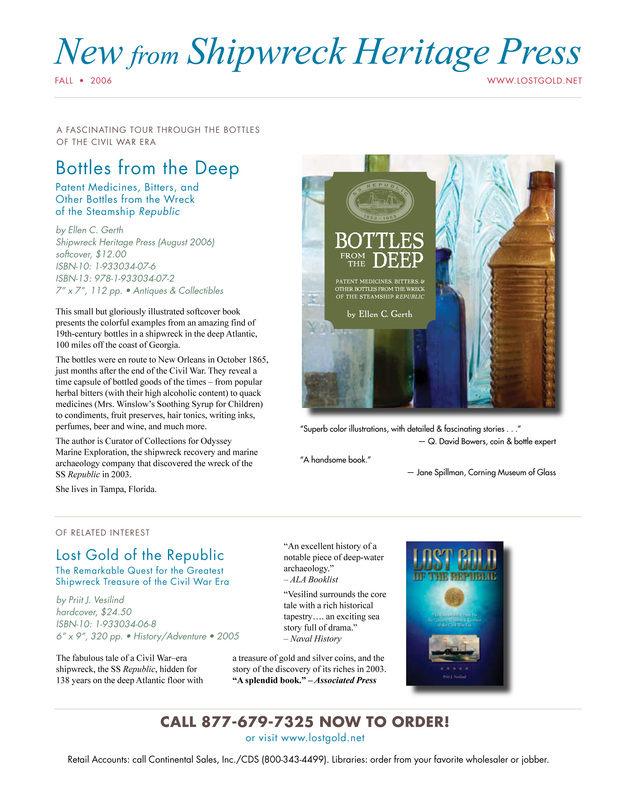 Now this small companion book tells the tale of the intriguing array of bottles recovered from the deep-sea wreck: a total of more than 6,000 bottles, a cargo being carried to New Orleans to replenish merchants' shelves. The diverse shapes and colors reflect a rich heritage of bottled goods in use in the mid-1860s. Amazingly, most of the bottles were found unbroken, some still even containing their original contents. Many, however, had their cork seals inside, pushed in by the tremendous water pressure at the depth of 1,700 feet. Each specimen, hand-blown into a mold, is a work of art in itself. The stories these bottles tell speak to a time when virtually anything could be bottled, advertised, and sold, when manufacturers swindled the public with outrageous claims and when early victories of Prohibition had lost momentum. Categories in the BOTTLES FROM THE DEEP book include patent medicines; bitters; wine, beer, & spirits; food bottles; hair products & beauty aids; and ink bottles. The range of products and their containers - from bear-grease pomades to French perfumes, from hot pepper sauces to beer and wine, from century-old peaches or pineapples to quack medicines of all sorts - convey a delightful and often quirky glimpse of a long-gone era, discovered in the beautiful translucent shapes of bottles from the deep.